Originally known as Metters "M" windmills, Yellowtail windmills have now been in production for over forty years. 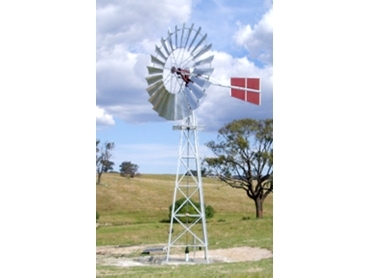 They are available from Windmill Engineering Co , a third generation business which always keeps an eye on new developments and technology and offers design and service of the highest order. Yellowtail windmills are built to last. The wheel arms, or spokes, are built as a one piece A frame to make assembly easier, and to provide a more rigid structure to the Windwheel. To ensure they will not work loose, their sails are built around the outer ring. The entire Windwheel bolts together under tension to create a tight structure that can handle gale force winds.